As I’ve said before, I have a nice wok and all of the wok tools one could wish for. I still have no good reason why I only pull it out twice a year. It’s really silly because we all love Asian style food and Asian food is really easy, fresh and healthy. AND.. there is only one pot to wash! So when I married my husband he would eat nothing but meat and potatoes. Why? You ask. It was because he grew up in Upstate New York, on a farm and they ate, you guessed it, meat and potatoes. I, on the other hand, grew up with a Mother who was a great, adventurous cook and loved to try new things. This, needless to say, was a bone of contention at first. After the whole honeymoon period thing, I gave up and cooked things that I liked (being thoroughly sick of meat and potatoes) and would say, “There is absolutely no reason that you will not like this. It has meat in it and the round thing is made of corn, which you love” Hence I got him to eat tacos. 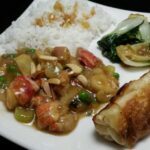 You can use any seafood, chicken, beef or pork to make an Asian style Ding with Almonds. The almonds add a super crunch and texture to the dish. In this case we used lobster so the first thing to do is to par boil the lobster. Don’t cook it too long (for a 1 lb. or 1 1/2 lb. lobster, only cook it for about 6 minutes, once the water comes back to a boil.) because you have heat it up in the sauce and if it’s overcooked, it will be tough. The cooking of lobster is a hotly debated topic. Broiling, steaming, grilling, boiling, etc. Our local fish monger suggests that boiling is the way to go because there is less trauma to the lobster therefore the meat ends up more tender. I tend to agree and we have cooked it all of the ways listed above and it seems the lobster is just not quite as tender. Make sure you have a kettle large enough to accommodate all of the lobster and that there is enough water in the kettle to cover them, with room to spare. Once the water boils add the lobster, headfirst carefully, in case the water splashes. Cover and let the water return to a boil, then remove the lid and boil hard for again, about 6 minutes. Remove the meat from the tail and claws then chop into bite sized pieces. Add a teaspoon or so oil to the pan or wok. Toast the almonds until golden brown, stirring occasionally. Once the almonds are browned, drain on a paper towel. Add a bit more oil to the wok and stir fry the celery until tender crisp. Add bamboo shoots and water chestnuts. Stir fry another minute just to warm them through. Remove the veges to a bowl. To make the sauce, lightly brown the onion in a bit more oil in the wok. Add scallions, and garlic and stir fry a few more minutes. When vegetables are soft, add rice vinegar, soy sauce, sesame oil, and sherry. Bring to boil. Then add the cornstarch and water mixture. The color will start like this. I use a whisk once I put the cornstarch in to eliminate any lumps that may form. Once the cornstarch is cooked and the sauce has thickened it takes on a nice deep brown color. Add the frozen peas and cook until peas are almost cooked. Add the lobster and mix together with the vegetables, just long enough to heat through. Serve immediately with Jasmine Rice, which I am, incidentally, addicted to of late! Love Chinese takout food? This Sesame Orange Chicken is amazing! A quick version of the Chinese - American Take-out dish! Peanut Canola or Olive oil for stir frying, 2 Tbsp. Boil lobster in a large pot that is large enough to accommodate lobster and enough water to fully cover lobster for about 6 minutes, start timing after water returns to a boil. Toast sesame seeds in wok or large frying pan until lightly golden brown. They will continue to brown when removed from heat. When lobsters are cool enough to handle, remove meat from claws and tail. Chop into bite sized pieces and set aside. Stir fry celery until tender but still very crisp. Add the bamboo shoots, water chestnuts and mushrooms and heat through. Remove vegetables to a bowl. Stir fry onion until golden and then add garlic and fry a few more minutes. Add soy sauce, sesame oil, lobster stock and heat to a fast boil and then add cornstarch mixture. Use a whisk to ensure no lumps form in your sauce. Once the sauce is thick, bubbly and turns a deep brown add the peas and cook for a couple minutes. Taste and salt and pepper, to taste. Add the vegetables back to the wok and heat through. Once vegetables are heated through, add lobster and just heat that through. Serve immediately with your favorite rice. I also married a meat and potatoes man, but OMG has he changed since I married him. He’s into all kinds of cuisines now. These spring rolls sound delish! LOL, Kylee! They can be taught! !